“Every child can be successful if they know you care” has been Mrs. Bartlome’s educational philosophy since she began her teaching career in 1991. Her passion for students and their well-being has created a welcoming atmosphere at Sailorway. Parents and community members are encouraged to join the staff as we strive to offer excellent educational opportunities for all types of learners. Several volunteer options are available at Sailorway – just call the school to learn more! Mrs. Bartlome is a hometown girl through and through. She graduated from Vermilion High School, then attended Ashland University, earning her Bachelor’s degree in K-8 Education. She taught and coached for three years at Western Reserve and three years at North Central School District before returning to Vermilion in 2001 to teach 6th grade. Later, Mrs. Bartlome earned a Masters degree and Administrative Certificate through Ashland University. 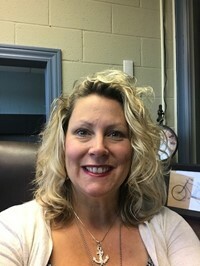 In the spring of 2012 Mrs. Bartlome accepted the position of Assistant Principal, and was awarded the position of Principal in August 2017. Mrs. Bartlome looks forward to many more years of service to her much loved alma mater and home town!